Happy Thanksgiving! 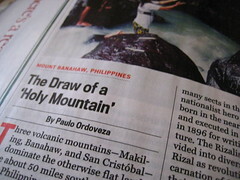 Be sure to open up this week’s U.S. News and World Report to page 60, where you’ll find my article “The Draw of a ‘Holy Mountain,'” on Mount Banahaw in the Philippines, part of a larger series on Sacred Places. I’ve never actually been to the “pilgrimage” parts of Banahaw myself, (though my family does have history in Majayjay) so I asked family and friends who’d gone on trips with the Rizalistas, looked around Pinoy weblogs and photos for travelers who had been on pilgrimages, and tried to order Fr. Gorospe’s book “Banahaw: Conversations with a Pilgrim to the Power Mountain.” (The book was, unfortunately, out of stock at Alibris and would not have arrived in time for deadline, but I gleaned enough from excerpts to provide sufficient material.) The article has been edited down for space, but if you’re at all interested, you can read the original, longer draft here. cool! i’ll make sure to pick one up. Very cool! I will check for a copy at Borders’ tomorrow; I hope it is still there. It’s always interesting to read your blogs. I will look for your article on Banahaw.